Introduction from Liz: Camilla wrote me a few months ago and I was moved by what she had to say. 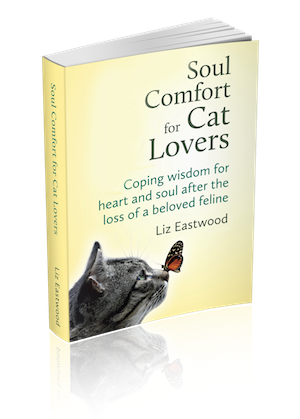 She talked about her soul cat, Gizmo, and said my book helped her through her grief when she had to say goodbye to him. 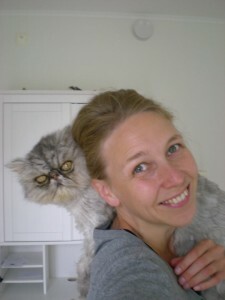 She mentioned that she wrote about her cat and loss for Animal Rights Sweden’s magazine. The article had resonated loudly with readers! I asked her if I could publish an English adaptation of it and she graciously agreed. If you’ve ever loved and lost, I think you’ll appreciate Camilla’s words. I lost my older cat to kidney failure last summer, and suddenly I no longer had my best friend with me. Our special way of communicating, our everyday closeness, his great presence – everything was gone. There I was, an adult accustomed to being able to organize and to always fix things, facing something that I could not sort out. I was completely unbalanced by the grief that hit me. I knew I would mourn him a lot because he was a very special cat: he was my feline soulmate and when the love is strong, the mourning will be strong. My whole being was consumed with thoughts of what I could have done differently in order to keep him alive. Gizmo was a rescue who had been mistreated by a breeder, but with Camilla he had a long, very happy life. You can see their bond. 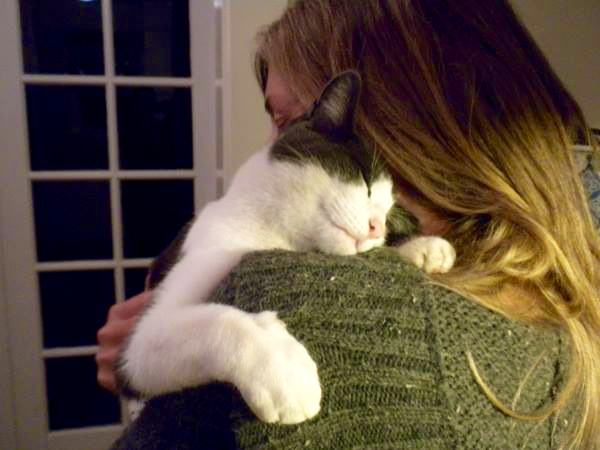 The relationship with a cat, a dog or any other animal can be a human’s principal and longest lasting relationship. A minister I talked to told me about how she once had let an animal be included as next of kin at a funeral. The animals are family. The loss of an animal affects us at least as hard as other losses in our life. The process of grieving a beloved animal we shared everyday life with, that we had our own little games and routines together with, should receive more respect and should be worthy of much more attention than it’s been warranted. In my search for support after the loss of my cat, I discovered that there was a void in what was available for supporting people who are grieving an animal’s death. On my country’s public health website there was no mention of grieving an animal. I found that, in Sweden, it is possible to talk with a minister or a counselor from the public health service when grieving an animal friend, but this is not advertised on their websites. As I was grieving, I spoke with people who shared the experience of having lost an animal companion. They have shared many wonderful stories about the bond created between humans and animals as we live close to each other, about what animals meant to them and how hard it is to be separated by death. It is particularly difficult because it is often we ourselves who must make the decision to end our beloved friend’s life. “What does it matter that we from the beginning knew that the dog’s life is shorter than our own? And what use is it to try to be sensible? It was, after all, never with our mind that we loved.” These lines were written by Mickie Gustafson in To Lose a Dog, one of the few books that deal with the topic of human-animal relationships at the end of life. Recently two other cats found their way to my home. They had been abandoned in a carrier at a bus stop. Their adoption is one of the ways in which I would like to honor the memory of my cat, Gizmo, who himself came to me from a shelter, neglected and frightened. The adoption of a homeless animal may not change the world, but it can change someone’s entire world. Although we know that the day will come when we must part, we can try to make the world a better place for the animals, just as they make everyday life better for us. Camilla Björkbom is the President of Sweden’s largest animal rights NGO, Djurens Rätt. She has been living with cats all her life, and has provided a temporary foster home to dozens of shelter cats. She currently lives with three rescue cats: Alvin, Morka and Lady. I recently lost my female cat (The Squizz) to small cell lymphoma and several other diseases. My sister, who is a cat lover, sent me your book. It is so helpful and insightful. I can’t have children so my cats are my babies. I was hit hard by the loss of her. The day she was euthanized, I was numb with grief and pain. That evening as I was sitting at the table halfheartedly doing something, I kept seeing out of the corner of my eye something moving under the table. I finally paid attention to it and a white orb of light flew under the table… twice. The orb then changed into an orange spark of light. It squiggled around my feet so fast. In my heart I felt that it was Squizz letting me know he was doing great and that she loved me. Later that night as I was trying to go to sleep, I saw in my mind’s eye a heart shape. The heart then changed into Squizz’s dear little face and then back into a heart shape. She was telling me, in an unmistakable way, that she loved me. I felt such gratitude and love. It made a world of difference to me. Squizz was doing fine on the other side, and will be there waiting for me. It also comforted me to know that she kept her identity after death because I had read that animals have a collective soul and go back into it at death. That may be true for animals that never had a connection to a human (wild animals) but Squizz was still Squizz. She was so quirky and funny and I miss her so much. Thank you for posting this. It’s so true that our relationships with our animal friends are just as important to many of us as our human relationships are. I personally find it hard to accept when people don’t see their pets as full family members. We are their world and in many cases, they are ours. Love is important regardless of species. I agree with you 100+ percent! We share this planet with many other species of living beings and ideally we should be their caretakers and friends. There is a kind of love I share with animals that knows no limits and it never runs out. I don’t think I’d ever known this if it weren’t for animals. I also support a plant based diet. It is better to heal than it is to kill. I completely agree that mourning the loss of a pet – one you have loved and been closer to than any human- generally, goes unrecognized by society and is not acknowledged as having significance. I would say that we usually mourn MORE deeply for our beloved pets than for other human family members and friends that pass on. It is a much a more painful grieving period than is supposed. Our darling fur babies are so very close to us. They are always there! With us. In the same room. Under our feet. In our laps. At the foot of our beds. When they leave their bodies in death, it is a searingly heartbreaking loss- one that deserves the utmost respect just like any other. Deepest condolences to anyone reading this who has known this pain and had to learn to live without their darling pet. What you have said is so very true. It hurts me worse to lose one of my pets than it does to lose a person, even if they’re a family member. People and their companion pets can freely open their hearts to one another in a way where there is no fear of rejection or criticism. This can form a very deep bonding of the hearts. The loss of a pet can feel devastating, but out of great sorrow can also come great joy. I try to adopt as soon as I can. The joy it brings me to see the spark life return to the sad eyes of a cat or dog who had no home or who has never known any real love is like a healing balm to my broken heart. I adopted my German Shepherd, Gretta, three days before losing my 14 year old Shepherd, Gypsy. Then, when Gretta became old and passed on, I adopted a rescue puppy the next day. A veterinarian I once knew told me that if we didn’t eventually lose our pets, then who would care for the ones who have no home? I’ve always remembered that. I’ve also found that it’s been the best medicine for my broken heart when I lose a pet. The grief is still there, but that I am able to bring something good out of my loss makes it worth the trip. I hope this is helpful and supportive to those who have recently lost a pet. Personally, I have a 14-year-old dog at home, and a 17-year-old cat, so I will soon need the podcast, too. Thank you for mentioning my new podcast. I have a new episode coming out tomorrow! Thank you so much. I have never had any friendship with a human that is anything like the bond I have with animals. They have an inborn purity of character that is unmatched. Yes, it hurts something awful when they someday depart this earth and leave us here to tary for a while longer, but it would hurt way, way more to have never known them. I also know the joy of adopting after losing pets that meant more to me than I do to myself. A few months ago after I lost my 12 yr old German Shepherd, the very next day I adopted a rescue puppy who had shearing injuries on two of her legs from having been hit by a car. Welcome home, Rosie! Rosie was like a healing balm for my broken heart. We were a gift to each other. And, thankfully she has made a full recovery. Weather the time I have with my pets during their stay on this earth is long or short, we are PACKMATES FOREVER!!! I love your comment here Viv! Especially “it hurts something awful when they someday depart this earth and leave us here to tary for a while longer, but it would hurt way, way more to have never known them.” Yes, Packmates forever!